By 1943, it became increasingly clear that WW2 was going to end in success for the Allied forces, and thus there was increasing interest amongst politicians and economists regarding post-war re-construction. In 1944 in the New Hampshire town of Bretton Woods, 44 allied nations agreed on a new system of international monetary management which, it was hoped, would promote stability and ultimately, peace. A well-known and inescapable trade-off in monetary economics is that a country with its own currency can either choose a fixed value for its currency vis-à-vis other global currencies, or it can choose a floating value for its currency, whereby the market determines exchange rates relative to other global currencies. There are merits and drawbacks of both systems, with some countries having tried to establish a half-way solution with varying success. A fixed system is advantageous for trade as it reduces uncertainty around a country’s values of imports and exports. A floating system however, allows monetary responses to shocks (such as recessions, or high demand during war). The norm since 1870/80 was for all major economies to have a fixed exchange rate system based on free convertibility to gold (this has become known as the ‘Gold Standard’). During the period 1870-1914, global trade tripled. The huge gains from international trade in the 19th century and an absence of stability costs (such as cyclical unemployment) resulted in the persistence of a global fixed exchange system. The onset of the Great Depression, however, undermined this global consensus on the advantages of the Gold Standard. A collapse in global trade (assisted by the erosion of free trade and the adoption of protectionist policies) significantly reduced the trade gains of a fixed system. Furthermore, programs of fiscal and monetary expansions and competitive devaluations to combat the depression required a degree of flexibility which was not achievable within a fixed system. Thus, in the years running up to the beginning of WW2, many countries abandoned the Gold Standard which, arguably, further heralded the coming of global conflict. John Maynard Keynes and his American counter-part Dexter White were the principal economists behind the design of a new fixed exchange system – the Bretton Woods system. There emerged a broad consensus amongst the allies that sustained peace would be brought about by eliminating high tariffs, trade barriers, and unfair economic competition so that no nation would become jealous of another’s living standards which could ultimately breed the grievances that lead to war. The US also had an incentive to depart from the reparation policies and isolationist stance it had taken in 1918 and to provide liquidity and dollars to the war-ravaged countries of Europe to stave off a growing fear of communism sweeping the continent. 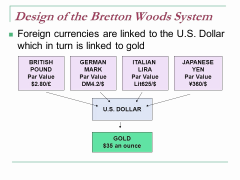 The Bretton Woods system ultimately sacrificed capital mobility (the ability for investors to freely move capital from one country to another) so that countries could have a fixed exchange rate (all currencies were pegged directly or in-directly to the dollar, which in turn was pegged to gold). However, governments could also pursue expansionary monetary and fiscal policies by restricting trades in currency, so that effective Keynesian demand policies (such as public works programs) could be enacted in the post-war period. The widespread adoption and acceptance of this system by the non-communist nations after WW2 helped to spur a so-called ‘Golden Age’ of capitalism, where rapid growth in productivity and living standards was witnessed across the developed world. The importance of global stability ensured by the functioning of the Bretton Woods system facilitated the prosperity of this period and indeed led UK Prime minister Harold Macmillan to proclaim in 1957 that the British people had ‘never had it so good’. However, the Bretton Woods system was ultimately flawed, and would only last until the 1970s, ending any notion of a ‘Golden Age’ and plunging the global economy into a decade of low growth and recession.